Max Lucado has written more books than most people have read in their lifetime! This book is not new material; it's a repackaged, condensed edition of his earlier title, The Cure for the Common Life. That fact, though, doesn't take anything away from this offering. 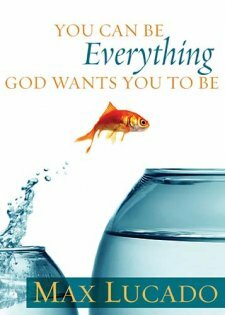 In his typical fashion, Lucado (the long-time pastor of Oak Hills Church in San Antonio, Texas) weaves Scripture, stories, and common sense into a package that is easy and uplifting to read. He calls the reader across the sacred-secular divide by pointing out, "Heaven's calendar has seven Sundays a week. God sanctifies each day. He conducts holy business at all hour and in all places" (p. 23). He assists the reader in discerning their own "sweet spot," which he places in the center position of a Venn Diagram consisting of "My Everyday Life," "My Strengths," and "God's Glory." He inspires the reader to live the life that they alone can live: "You can't be your hero, your parent, or your big brother. ... You can only be you. All you have to give is what you've been given to give. Concentrate on who you are and what you have" (p. 75). There's a sticker on the cover of the book that says, "Perfect Gift for the Graduate," and I agree with that! Buy a dozen and keep them on hand to give to any student who wanders into your office.